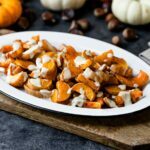 This spiced butternut squash with drizzled with a tahini sauce is not your usual Thanksgiving side dish! The combination of squash and warm spices is super satisfying! Cut off ends of the squash. Slice the squash in half lengthwise. Remove the seeds and pith. Cut the squash into pieces approximately 1/4-inch thick. Pile the squash on a baking sheet and drizzle with olive oil. Add the salt, cinnamon and cumin on top. Mix and spread into an even layer. Roast the squash in preheated oven until tender, 25-35 minutes. While roasting, prepare the tahini sauce. In a bowl, combine the tahini, lemon juice, salt and garlic. Whisk the mixture together until combined. At first, the lemon juice may make the tahini seem curdled, but continue whisking until smooth. If the sauce seems thick, add water one tablespoon at a time until thin enough to drizzle. When the squash is finished roasting, place on serving dish and drizzle with the sauce. Personally, I like to pass the garlic through a garlic press. I find that it’s the easiest way. Feel free to use whatever method you prefer to get your garlic ready.